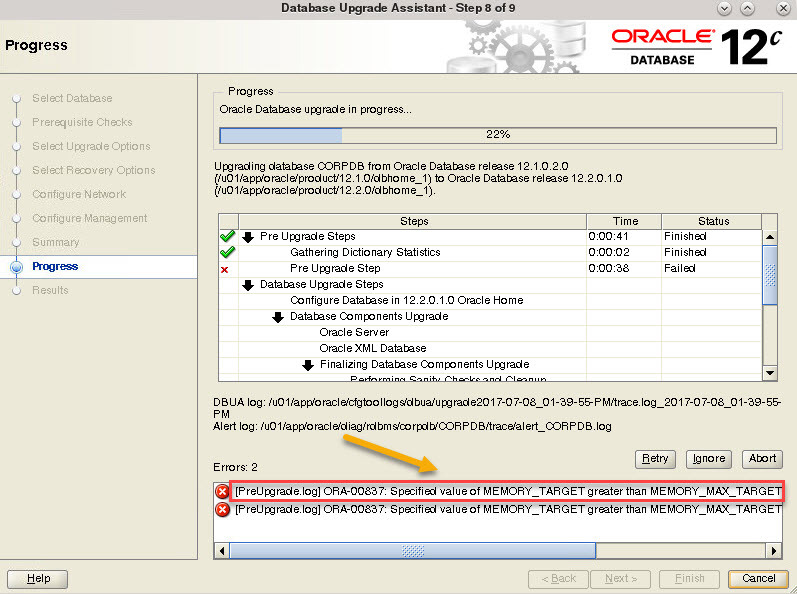 Oracle 12c R2 base release (12.2.0.1) supports direct upgrade from Oracle 11.2.0.3, 12.1.0.1 and 12.1.0.2 respectively. While we were performing a non-CDB database upgrade from 12.1.0.2 to 12.2.0.1, we were facing the ORA-00837: Specified value of MEMORY_TARGET greater than MEMORY_MAX_TARGET error during the Pre Upgrade step. Our database name is CORPDB and when we checked the parameter values, the MEMORY_TARGET value was 800 MB and it is less than the value of MEMORY_MAX_TARGET which is 1000 MB. But we were still facing this error. 2) Search for memory_target inside this log file. 4) Abort the upgrade. Close the dbua program by clicking on the Abort button. 6) Launch the dbua tool again and you will notice that the Pre Upgrade Step is completed successfully. The minimum size of 1500 MB for memory_target* parameters seems to be only a requirement while upgrading from Oracle 12c R1 to 12c R2. If you create a new 12c R2 database directly using the dbca tool (Database Configuration Assistant), then this requirement does not apply. We were able to create a new database using just 1000 MB for memory_target (Automated Memory Management). 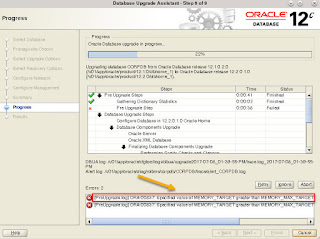 This unique requirement while performing the database upgrade is surprising and it is not documented in the Oracle 12c R2 upgrade guide. Copyright 2007 - 2017 DBA University, Inc. All Rights Reserved. No content of this website may be reprinted or otherwise reproduced without DBA University's permission. The posts and comments in this blog are on an "AS IS" basis without warranties. Always test your changes before pushing them to a real-time system ! Oracle is a registered trademark of Oracle Corporation and/or its affiliates .Other names may be trademarks of their respective owners.